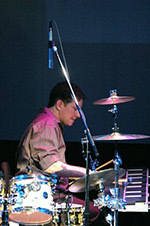 Paul Borrello is a percussionist, drum set, and mallet player that lives in the Capitol region. He studied music at the Berklee School of Music in Boston, received an Associates degree from Schenectady Community College and received a Bachelors degree in music industry and a teaching certification from Saint Rose. He will also have completed a Masters degree at Boston University in the fall of 2013. Paul has worked with many notable musicians in the capitol region such as Maria Zemauntauski, Dan Dobek, Sten Isaachsen, George Muscatello, Peter Einhorn, and many others. Paul is currently working with the John Savage Band, the LAB Trio with Bill Leary and Brian Axford and Ten 27 with Monica Roach. Paul also performs on vibraphone in a piano-vibes duo with Michael Roach. Paul has studied with Ed Saindon from Berklee School of Music, Jay Hoggard from Wesleyan and pianist Dan Dobek. Presently, he teaches instrumental lessons at the Brown School in Niskayuna, New York.